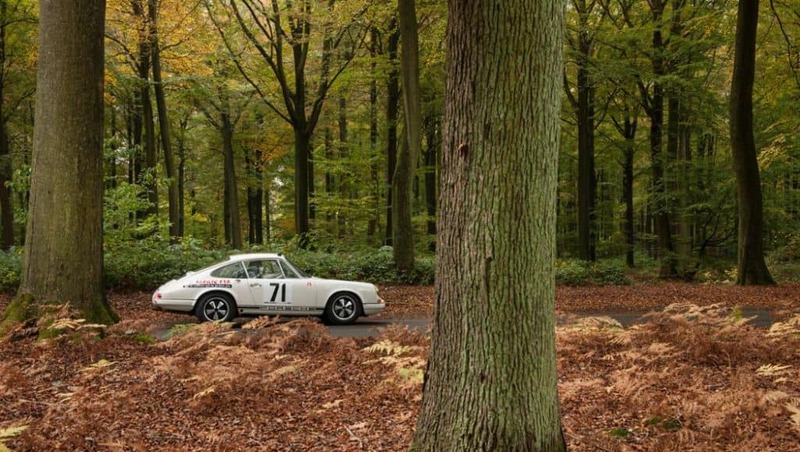 Deep in the forest, an exceptionally rare Porsche – a 1968 911 R – roars into life. One of just 19 lightweight models ever built, the car boasts a unique, fully documented body and engine combination and a prestigious racing history. Its past drivers include none other than Gérard Larousse. This is the extraordinary tale of a buried Porsche treasure. In the distance, a woodpecker drums its steady beat against a tree. The faint echo reverberates as the branches of the bare trees sway back and forth in the wind. In this forest just to the south of the metropolis of Brussels, all is calm and peaceful. But the mechanical noise of an ignition key turning interrupts the idyllic scene. The fuel pump hums into life, the starter fires up the 10.5:1 engine and sets the crankshaft in motion. 66 millimetres up and 66 down, then the dual ignition responds – the 46-mm IDA triple-barrel carburettor provides a high-precision mixture of fuel and air, awakening the two-litre naturally aspirated engine from its slumber with a foot on the gas. The modern stainless steel silencer certainly looks the part, but whether it actually does the job is another question altogether. The woodpecker has long since been drowned out by the unfiltered noise of a 210 hp Porsche six-cylinder flat engine. It’s enough to give me goose bumps – the sound is phenomenal, reminiscent of the first few seconds of the 1966 film “Grand Prix”, when the camera pans out of the black depths of the exhaust. It’s little wonder that the film’s accolades include an Oscar for best sound effects. And now that sound is here – live and in stereo. It reverberates through my jeans and feels as though it is travelling in the asphalt under my feet, creeping into my body through the soles of my Converse. Kobus Cantraine smiles, and says – or, more accurately, shouts – “It would just be wrong to sell it. It’s too beautiful, right?” Then he puts his foot to the floor and sweeps past the camera. The sight of the round rear lights disappearing on the horizon is unforgettable, leaving the rumbling dry echo of the racing car to persist in its wake. So that was it: the Porsche 911 R with chassis number 11899016R, number 16 of 19 to roll off the production line. 49 years old and showing no signs of slowing down. It’s almost exactly 49 years to the day since the day the car was ‘born’: The Kardex card confirms that the car was delivered to the dealer Sonauto in Paris on April 9, 1968. 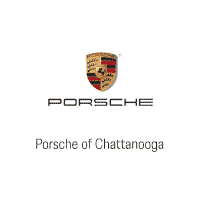 Porsche was notified of the car’s purchase on April 24. Its first owner was a company called “Le Danseurs”, which belonged to French entrepreneur and racing driver Claude Ballot-Léna. So far, so good. But there are some other handwritten notes on the Kardex, the most important of which indicates that the car had a 170 hp engine. A perplexing detail – surely the card should state 210 hp? Other Porsche documents reveal more: The original engine, number 5080016, was replaced with engine number 961770 when the car had just 40 kilometres on the clock, as evidenced by a single concise and casual remark: “Car converted from type 911 R to type 911 S.” The Kardex card provides an explanation: “S engine fitted, as 911 Rs were not saleable”. Ballot-Léna wanted the luxury of a lightweight Porsche 911 combined with the many comfort and convenience features of the 911 S, as he intended to use the car on the road rather than the track. The specification of his “R” is described on the Kardex: “interior panelling, foot mats, normal seat on right.” This was an unorthodox approach, considering the fact that a 911 R came with a price tag of around 45,000 marks at the time, while the “standard” 911 S came in at around half that. But to then add another 10,048.47 marks in conversion costs to the bill before the car has even made it out of the factory? Who would even entertain such an idea? Apparently, only Claude Ballot-Léna – as there are no other known cases of such an unusual R-type conversion. Weighing in at around 70 kilograms heavier (with safety belts and ten litres of fuel in the tank), but with around an entire VW Beetle’s worth less power thanks to its new 901/02 engine, the 911 R – sorry, S – cruised the streets of Bagnolet in Bobigny, on the outskirts of Paris. However, in June of that year, the first owner sold the car to Xavier Camprubi, a private racing driver who was keen to use the Porsche as originally intended by its designers: on the track. And so the backtracking began: Camprubi had the car converted back into an R-type by the racing department of Sonauto. 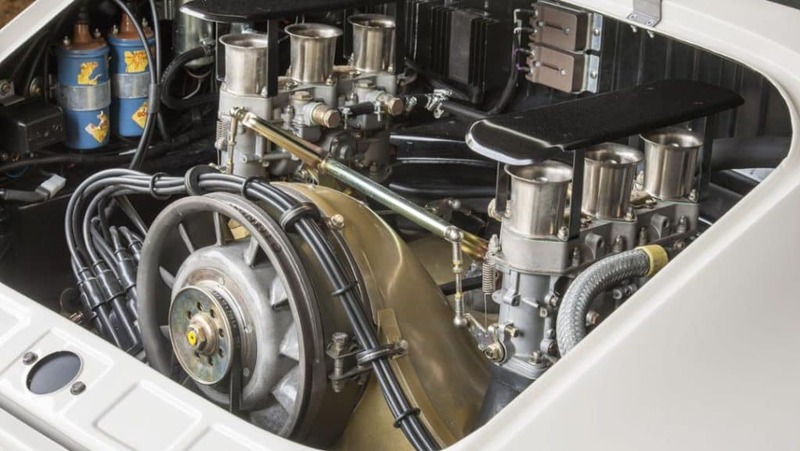 All the internal panelling and elements of a normal, non-racing car were removed, and the engine was replaced with a 911-R type 901/22 model, numbered AT 961770. In the first few months of its life, this incredibly rare Porsche was radically altered not once, but twice. With this tumultuous history, it was a challenge for Kobus Cantraine to work out precisely what had been done to the car – and to verify exactly what he was looking at – when he bought the restored vehicle in 2016. Had he really bought number 16? Or had someone somehow put a 911 R together using lightweight parts from another car, such as a 912? “I’ve not found any evidence that this is not car number 16”, he explains. All of the documents back up this assumption. Magnetic resonance scanning has shown a blank, untouched piece of metal where the VIN would normally be embossed on a standard 911 – and a cleanly imprinted number in the chassis number location for the R. Other details that would be difficult to falsify also proved accurate. So why the doubt? First of all, converting a 911 to an “R” type using readily available parts is an attractive idea from a financial perspective. Secondly, historic photographs suggest that this 911 R could have undergone an undocumented body replacement in its racing car era. Such an action would have been perfectly plausible after a serious accident that took place at Rallye de l’Hérault, with Bernard Gnuva at the wheel. On all of the photographs taken of the car after this race, the rear end looks significantly wider. Is it possible that only the side sections were replaced? Kobus Cantraine nods: “That’s highly likely”. As evidence to support his assumption, he reports that the open weld seam below the door, where the door sill meets the side section, remained visible even after the accident. This was just one area where Porsche made weight savings. No tin, no sealant, no interior panelling, drilled holes everywhere, light materials, thin sheet metal – the “R” model is a meticulous adaptation of the 911. The decision to replace the rear lights with round Hella lights and use fibre-reinforced plastic components made especially for this car, represented an enormous modification to the design – just to save a few grams of weight. The 911 R bodies, built by Baur, were optimised for speed in every possible way: With fibre-reinforced plastic components, aluminium, thin wood (not unlike that used to build model aeroplanes), lighter dashboard overlays, no covers or plugs in unused holes that would otherwise have been occupied by series-standard equipment, thin glass, Plexiglas, leather straps instead of window cranks with heavy scissor mechanisms, pull ropes instead of interior handles, no sun visor on the right, no heating – in fact, nothing but 210 hp and 100 litres of fuel. Today, Ferdinand Piëch is widely credited as the driving force behind the 911 R. In the summer of 1966, work commenced on a rally version of the Porsche 901/911 that had just been launched. The objective was to keep the weight-to-power ratio as low as possible. Racing expert Rolf Wütherich got to work and calculated that, at an unladen weight of 800 kilograms, 210 hp would be sufficient to achieve a weight-to-power ratio of under four kilograms per unit of horsepower – beating the offering of his contemporary competitors by around 1.5 kilograms. Such considerations were necessary for sports car manufacturer Porsche to continue achieving good sales. But the new 911 was not a fast seller, and the high development and production costs had resulted in a car that was more expensive than expected. The company successfully counteracted this issue with the 912: Porsche sold almost twice as many of its “new woman” in the range than of the new top model, which had been marketed as the new “SC” to the public. Meanwhile, the fact that 911s could be successful on the track was being proven by private drivers rather than the factory itself. A rally version was required, and the Porsche engineers deftly esigned a vehicle that came close to the golden figure of 800 kilograms unladen weight, slimming the 911 S down by about 200 kilograms in weight. The second major focus was the engine. The 901/22, which had already been used with great success in the Carrera 6, was the starting point for the new rally car. Dual ignition, titanium connecting rods and torque-proof beyond 8,000 revs – resulting in a car that could deliver zero to 100 km/h in under six seconds, and a standing kilometre in just over 24 seconds. In addition to speed, proving the reliability of the engine was a particularly important factor for Porsche. With this in mind, in autumn 1967, the company used the car in a record attempt that was originally planned for the Carrera 6. But the Carrera was too low-riding for the steep banked corners of Monza and came down too hard on the road. Instead, Jo Siffert, Rico Steinemann, Charles Vögele and Dieter Spoerry drove the 911 R, with very few modifications. The car survived 20,000 kilometres at full throttle, set five new world records, achieved 14 international class victories and an average speed of over 200 km/h.The 911 R’s place in the racing car hall of fame was cemented thanks to Gérard Larrousse. In 1969, he won two major victories in his car, which was chassis number five. He went on to win the Tour de France Automobile from September 18 to 26, and was the overall winner of the Tour de Corse held on November 8 and 9. The 911 he drove was one of two “R” types with a DOHC engine and 230 hp. The car is now part of the Collier collection in the USA. However, in preparation for these races, Larrousse initially took to the track in a different 911 R – the very car at the centre of this tale. He competed in at least one official race: the Ronde Cévenole on June 7 and 8, 1969. His lap times were outstanding, and he maintained a constant second place, coming in just under half a minute behind Giunti, the driver in pole position in an Alfa Romeo 33/2 prototype – only a slim gap in a race where lap times average around 3:15 to 3:20. In the ninth and penultimate lap, the right steering knuckle at the front of the car snapped on the small connecting road just before the start and finish straight. The issue brought the race to an abrupt end for Porsche – luckily before the car was damaged or the driver was hurt. Photographic evidence indicates that a minor accident occurred during the eighth lap: The scratches on the bumper, masking tape on the headlights and the crooked rear wheel clearly indicate that an incident on the track could have caused the later failure of the knuckle component. Xavier Camprubi, who lent Larrousse his Porsche for this race, was probably not best pleased about the damage. But we already know that this would not be the last of this car’s racing woes. In 1970, Camprubi commissioned a factory overhaul then sold the car to 24-year-old Bernard Gnuva. The volatile young driver was involved in a serious collision in the vehicle, and new metal doors and a wider rear wing were fitted. From 1973 onwards, the 911 R no. 16 was used on the road by Jean Gonçalves, then by Raymond Touroul, and finally by Jean-Pierre Bodin, before it was eventually incorporated into a private collection and restored. In 2016, Larrousse was reunited with “his” first 911 R and autographed it. Only after that did it receive its “Larrousse look” makeover from Kobus. 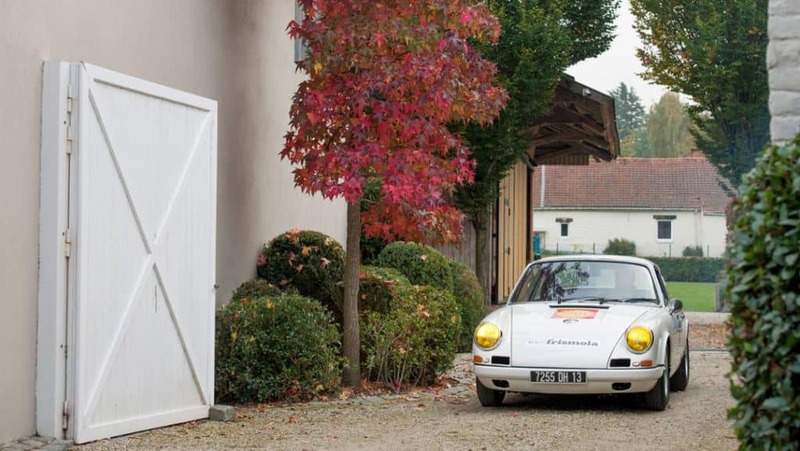 What a fantastic Porsche – with a fantastic story. Text first published in the magazine “Porsche Klassik 11”.